On Friday, my entire floor was to be packed up and ready to be moved to another tower. For someone like me, who hasn't had time to accumulate a lot of stuff, this wasn't a big problem. For others, particularily those who had been in their offices since the building opened they were packing and cleaning out their offices all week. 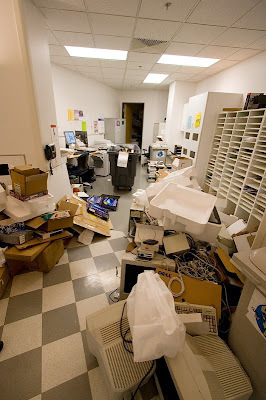 The amount of stuff thrown out was staggering and at its peak our entire kitchen/mail room was filled with stuff. Technical Specs: Canon 350D, 10-22 @ 10mm, f/5, 1/50s, ISO 400.